The new lawn finally arrived! Last weekend we had a stalled out bobcat tractor in our front yard and I’m sure our neighbors were thrilled with that. The tractor just died while ripping out our old lawn. They fixed it on Monday and had the rest of the old grass ripped out. On Friday, the new stuff was laid down and then today we noticed the grass was looking dry. Turns out they only set our sprinklers to 16 minutes. I jacked it up to 45 minutes. I’m going to water the hell out of this lawn. There’s no way I spent this much money on grass to just let it dry and and die. On Saturday was EA’s annual “company picnic”, which is basically tickets to our choice of Universal parks and lunch. 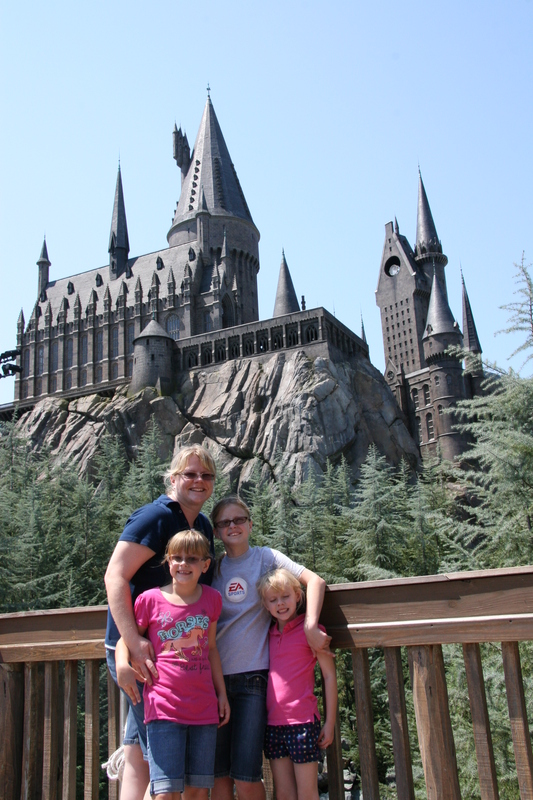 We chose Islands of Adventure because we had yet to go to The Wizarding World of Harry Potter. I’m not a big fan of the books or movies, but Jennifer and Abby like them. Jennifer has read the whole series and Abby just started the first book the other day. 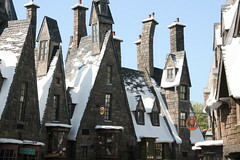 We entered the park and headed straight for Hogsmeade at the back of the park. 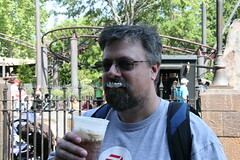 We had some Butterbeer which tasted like cream soda with extra cream on the top. We knew that we needed to get back to the Harry Potter Ride because the line would be crazy. We got there and the sign said a 75 minute wait and to top it off, Izzy was too short to ride it. Fortunately they offered what is called “ride swap”. We got in line (which took about 60 minutes) and when we got to the front, Jennifer and Emily rode while me and Abby waited with Izzy in a waiting room. When the ride was done, we switched with Jennifer and Emily. It is a very good ride. Like the Spiderman ride, it’s part screens which give you a sense of flying through the air and part fake dragons and spiders that drop down at you. Very well done. For lunch EA had bought out Jimmy Buffett’s Margaritaville for a couple of hours. We had a few drink tickets for margaritas and Cheeseburgers in Paradise to eat. I was impressed that we reserved the whole place for lunch. It was roped off to the public and you had to show your tickets in order to get inside. The kids were tireless. We walked all over that park riding stuff in Jurassic Park-land and getting soaked in Toonland on a Popeye ride. We kept threatening to leave, but the kids kept dragging us to different areas of the park. Finally at 7:00 p.m., we gave up and did a force march to the front of the park, Izzy crying the whole way. I guess 9 hours at Universal wasn’t enough for her. She promptly fell asleep when we got to the truck.